Delbert “Del” Paul Gariepy, 71, passed away at 7:14 a.m. on Friday, July 20, 2018, at his home near Mansfield, Missouri, after a nine-year battle with Leiomyosarcoma (LMS). Del was born on February 6, 1947, to Gilbert Normand Gariepy and Gertrude Elizabeth (Morris) Gariepy—on his mother’s 25th birthday—in Miami, Florida. When he was five, the family moved to Tiverton, Rhode Island, where he attended elementary and junior high school. He attended Bristol County Agricultural High School in Segregansett, Massachusetts, followed by three years at the Stockbridge School of Agriculture at the University of Massachusetts, majoring in Ornamental Horticulture and Park Management. Del served in the U.S. Navy, attached to an Air Squadron from February 1969-1973, serving in Guam and San Diego. In the fall of 1975, Del moved from Montana to the Springfield, Missouri, area. While he was preparing to make the move, he met Steve, the first Christian he had ever known. Steve led Del to Jesus; it was the best decision he had ever made. Del was united in marriage to Carol Lynne Tucker on September 11, 1976, in Springfield, Missouri. God blessed their home and family with four beautiful children! Del worked for the U.S. Geological Survey (1973-1975 and 1976-1982). He also worked for the Christian County Assessor from 1982-1983 before entering Burge School of Nursing in Springfield, Missouri. He graduated as an RN in 1986. During his first year at Burge, his family grew from one child in the home to four children as God brought his special family together in HIS time. 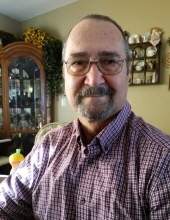 Del worked in many different capacities as an RN—Medical-Surgical, ER, Hospice, Home Health (Geriatric), Home Health (Pediatric – brain-damaged children), Cardiac Rehab, and over half of his 32-year career in ICU in various smaller hospitals in southern Missouri. Del enjoyed woodworking, leathercraft, gardening, canning, and beekeeping, but his favorite hobby was FARMING! He became known as “Farmer Del” to his fellow nurses and frequently introduced himself as “a farmer first and then a nurse.” Del was a loyal husband, father, and friend. Above all else, Del followed Jesus Christ with all of his heart, soul, and mind and wanted others to know the true reason for his life … to know his Lord and Savior, Jesus Christ. He was a member of Liberty Faith Church in Norwood, Missouri. Del was preceded in death by his father, Gilbert; his mother, Gertrude; and his sister, Jane Hancock. He has numerous children and four or more grandchildren waiting for him in heaven. Del is survived by his wife, Carol Lynne Gariepy; children—John Michael Gariepy (Keri) of Poplar Bluff, Julie Renée Gariepy of Springfield, Kimberly “Kimi” Marie Wilson (Matthew) of Mansfield, and Nicole “Coco” Lynne Habbyshaw (Nathan) of Gillette, Wyoming; 12 grandchildren—Allison Gariepy (16) & Asher Gariepy (14) of Poplar Bluff; Cristina Gariepy (6) and Ryan Bird (5) of Springfield; Abbie Wilson (12), Brandi Wilson (10), Anna Wilson (8), and Serena Wilson (6) of Mansfield; and Ethan Habbyshaw (6), Lillian Habbyshaw (4), Wyatt Habbyshaw (3), and Elli Habbyshaw (18-months), of Gillette, Wyoming. Del is also survived by his brother, Donald Gariepy, four nieces and three nephews, many cousins, and a host of friends – YOU are one of those special friends. Visitation will be at 9:45 a.m. on Saturday, August 4th, 2018, at Liberty Faith Church, 147 E. Jackson St., Norwood, Missouri (the corner of Hwy. 60 & Hwy C). Del’s Celebration of Life will be at 10:45 a.m. on Saturday, August 4th, 2018, at Liberty Faith Church, Norwood, Missouri (the corner of Hwy. 60 & Hwy. C), with Pastor Reg Kelly officiating. Burial will be at the Wolf Creek Cemetery (on Hunt Road and Wolf Creek Road/Adamson Road, Mansfield, Missouri, just off Hwy. AB) under the direction of Craig-Hurtt Funeral Home, Mountain Grove. Appreciation for their care is expressed to Del’s numerous doctors and nurses, Hospice Compassus/Mountain Grove, and the many friends and neighbors who have travelled with Del during his extended illness. To send flowers or a remembrance gift to the family of Delbert Gariepy, please visit our Tribute Store. "Email Address" would like to share the life celebration of Delbert Gariepy. Click on the "link" to go to share a favorite memory or leave a condolence message for the family.